I have always loved the story of Alma and how he came to find the gospel after living a not so perfect life. This has always been one of my favorite parts of the Book of Mormon. So with great excitement I started reading the novel based on his life. I had already read Heather's previous novel, "Abinadi", which by the way won the 2008 Whitney Award for Historical fiction. She also won the 2007 Whitney Award in Historical Fiction for her book "Out of Jerusalem: Land of Inheritance, book#4 in a series. I was entranced with the story of Abinadi. I kept hoping against hope that maybe just maybe he would make it in that novel, but sadly he died in the end, just as the scriptures told. "Alma" takes up where Abinadi ends. I would suggest reading Abinadi first or you may be lost about some of the characters and their story lines. With that said, "Alma" can be enjoyed on it's own, but I am a stickler for reading books in the right order when reading a series. she needs to humbly acknowledge herself here. I know that she puts in a lot of time thoroughly researching every book that she writes. 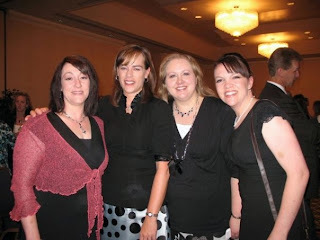 Here we (LDS Womens Book Review) are at the Whitney Awards, April, 2009: Sheila, Heather Moore, Shanda and Hillary. Back to "Alma", let's just say... I loved it! Heather has a way of bringing the Book of Mormon people and the country they resided in to life. You can see the colors and smell the smells of the mountains and streams. I became so totally engrossed in this book, I forgot I had already read this story in the Book of Mormon. Heather is such a great writer that she brings new life to old stories. I was waiting anxiously through the whole book waiting to see what happened in the end. Don't be fooled by thinking you have already read this story because you have read the Book of Mormon 20 times. "Alma" not only gives you the details you have read before, but Heather adds the emotions these valiant people lived through as they faced great trials in their lives. I was very anxious to interview Heather and have her answer some questions about the novel and about herself. She sent the answers back quickly and here they are for you. 1.How did you decide on which Book of Mormon characters to put in your novels? I looked at the prophets who I thought had a pretty tight story line, either in timeline or with a compelling set of circumstances. I chose to do the era of Abinadi and Alma because the conversion of Alma leads to the incredible conversion of so many others. And it all started with Abinadi’s willing sacrifice to preach until death. 2.Before you start writing, how much research do you do? What percent of your planning is spent on this research? Most of the research I do before writing is actually talking to people and getting their take on a Book of Mormon figure. This helps me form the character, the age, and what others’ expectations are. I’ll add some of my own creativity—which usually comes from asking “what if” into the mix—but I do have a responsibility to stay as true to the scriptural text as possible and mesh my ideas with the readers’ vision. I, of course, closely study the scriptures I’m covering, word by word, line by line. I look up the cross references. I read commentaries written by gospel scholars on the particular verses I’ll be covering. From there, I leave a lot of highlighted questions as I write, then I go into reference books to find out the smaller details—like what a typical Mesoamerican family eats for breakfast! 3.How old were you when you gained this love for the Book of Mormon? It is clearly evident that you have a great love for this book from your writing. I was in seminary when I first read the Book of Mormon from cover to cover in a relatively short time. I’d read the New Testament over and over as a youth because I had a really cool version with Olive Wood covers, and all of the words that Christ spoke were highlighted in red. So reading the Book of Mormon in a more serious light came when I was in high school. I read it off and on over the years, and when I was a young married mother, I took the “40 day” challenge and read it in 40 days. That really helped me piece together the timeline understand how the various groups of people fit together. 4.When is the best time for you to write? This changes every season. My youngest just started “kitten-garten,” and so my writing time is 12:45-3:10. Yes—every minute counts! When my second book was “due” to the publisher, I had to really work hard to meet the deadline—which consisted of writing from 4:00-7:00 a.m. Luckily I only had to do that for about 6 weeks. 5.How long did it take you to write your first book? How long does it take you now to write a novel? I wrote my very first book in about 12 weeks. I wasn’t editing as I went, but just writing freely. I wrote about 2,000 words a day, which I can do in about 2 hours if I really stay focused (no emails!). That first book was historical fiction (WWII) and still isn’t published. But the Book of Mormon books are quite intensive with the research. I’d say it takes a good five months from start to the second draft stage. That is if I write 1,000-2,000 words a day/5 days a week. This does not include research time, so I have to account for that as well. Writing is only the beginning—I also have to go through the editing process before submitting and that can take about 4 weeks if my beta readers are willing to turn around an edit in 1-2 weeks. 6.What are your future goals or dreams as a writer? I’ll continue to write for the LDS market as long as the readers support me. I also have other manuscripts that I’ve written for the national market; I hope they will see a publisher one day. 7.What is the main thing you hope your readers to gain from reading your novel, " Alma "? Alma is really a novel about second chances and the power of redemption. Some of the characters have lived lives of iniquity and as they discover and accept the truthfulness of the gospel, they find it challenging to accept the Atonement in its entirety. Most of the characters have gone through some horrific trials, and they learn to rely on the Lord in a most complete and utter way when they are essentially living in a pit of despair. I hope the readers come away with renewed hope and comfort that we can only find in placing our whole hearts and burdens upon the altar before the Lord and trusting in Him. I recently started writing the sequel to Alma. You guessed it: Alma the Younger. This new book opens up about 20 years after Alma the Elder and his people arrive in Zarahemla. One of the questions I’m asking myself is how do I have three to four “A” names in the same scene? Alma the Younger, Alma the Elder, Ammon, Aaron . . . It gets confusing! Nicknames, anyone? Alma the Younger drafted to a point that I can step away for a couple of weeks, I’ll be working on edits for the non-fiction book. 9.What is your best advice for aspiring writers? Writers educate themselves on the publishing industry (think college—yes, it’s intensive). Writers accept critiques—the good, the bad, the ugly. Writers continually improve their craft through reading, attending writers’ conferences and workshops. Writers don’t give up. Nor do they wait around, they write that 2nd manuscript. I recommend this book to anyone who has a great love for the Book of Mormon people. I also recommend this book to anyone who enjoys reading a story written by an author who writes free-flowing stories. Heather is one of those LDS authors I have been telling you about that i s very talented and a superb writer. 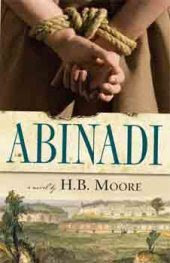 Heather's novel, "Abinadi" also won the 2009 Best of State in Literary Arts award. I can clearly see that Heather has many more exciting things in her future in the literary world. Please go visit her at her blog here:http://mywriterslair.blogspot.com/. You can also go to www.ldswomensbookreview.com and listen to Episode 35 where we had Heather Moore and author Annette Lyon as our guests for a July 2009, podcast. It is a lot of fun to hear them talk about their books and writing. Heather is not only a good writer, she's a good cheerleader and friend. She's been very positive when I've asked her questions, and was a popular speaker in our small town of Ephraim last year! I'm in the middle of Alma, and I'm loving it just as much as Abinadi! Heather I can't believe all of that happened after such a great night for you! I am so sorry! You are a rock star girl! I look up to you so much! Thanks for letting me part of your early review group.